The design starts on the greenbelt path outside Bianco Court and Chautauqua Apartments with a colorful compass, to help people find their way as they enter the neighborhood. But the real color gets going just north of Atria Covell Gardens, where WIND and AIR blow dandelion seeds and butterflies north. Field bindweed (also known as morning glory) breaks up the concrete. Bindweed is an invasive plant whose roots can go 8 feet in the soil, and seeds last 30 years -- and the same time it's gorgeous, with bright white flowers and heart-shaped leaves. Here it symbolizes the power of nature and SPIRIT to overcome what humankind makes, as it ushers all kinds of wildness within the concrete walkway. Bindweed introduces us to the element of EARTH, where we see ground birds and animals. The Sancofa bird is an African symbol of connection between the past and the future. It looks backwards as it cares for its future -- reminding us of the need to connect with the past in order to plan the future -- especially relevant in this intergenerational pathway that connect senior housing with college students and families. Next we see the turkey, native to the Americas, and frequently seen in large flocks walking the greenbelt. Turkeys face-off with a neighborhood dog. Dogs highlight our intercultural connections. The only animal that was domesticated in pre-Colombian Americas, with new breeds brought over with Europeans, dogs of all shapes, sizes, backgrounds and heritages peruse our neighborhood -- echoing the diversity of peoples who live here. As the pathway turns east, EARTH turns to VOID (aka SPIRIT), and then WATER, with orange fish and a native turtle in an Asian-inspired fish pond. Bindweed moves us through to FIRE, with bright red Chinese Pistache leaves (a gorgeous feature of our neighborhood in Autumn), heat-loving sunflowers and lizards. Escaping from fire into water again is the wild crayfish -- fierce little creatures who thrive in the north side of the 'hood in the north Davis ditch, and much beloved by neighborhood children who like to catch and release them, dodging their sharp claws. Here the mural fades for a moment as the pathway rounds the bend, but to the north side of the pathway, concrete opens into an asphalt cul-de-sac at Hacienda Avenue. Here flowing WATER turns into a wild water dragon, inspired by both Chinese dragons and the Pokemon players who frequent the neighborhood. 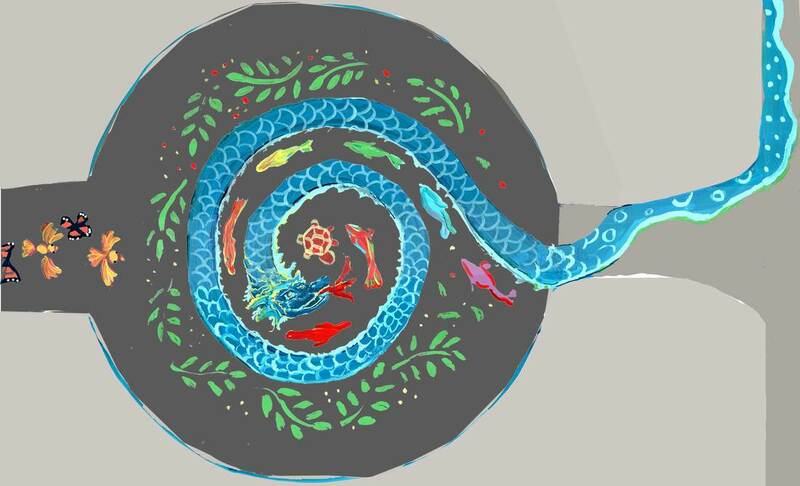 The water dragon doubles as a walking labyrinth, with rainbow fish swimming inside it. It breathes FIRE into the center, and is surrounded by leaves (WOOD) and flying butterflies and birds floating in on WIND from the north. A smaller design at Spider Park to the north would echo the animals seen here within a painted treehouse -- with plenty of empty concrete left over for kids to continue making chalk drawings. This is only a rough sketch at this point, as Spider Park is our STRETCH GOAL for funding. It would highlight connections . The Elemental Sidewalk north of Atria Covell Gardens is fully funded due to generous support from the City of Davis, the California Arts Council, and the National Endowment for the Arts. 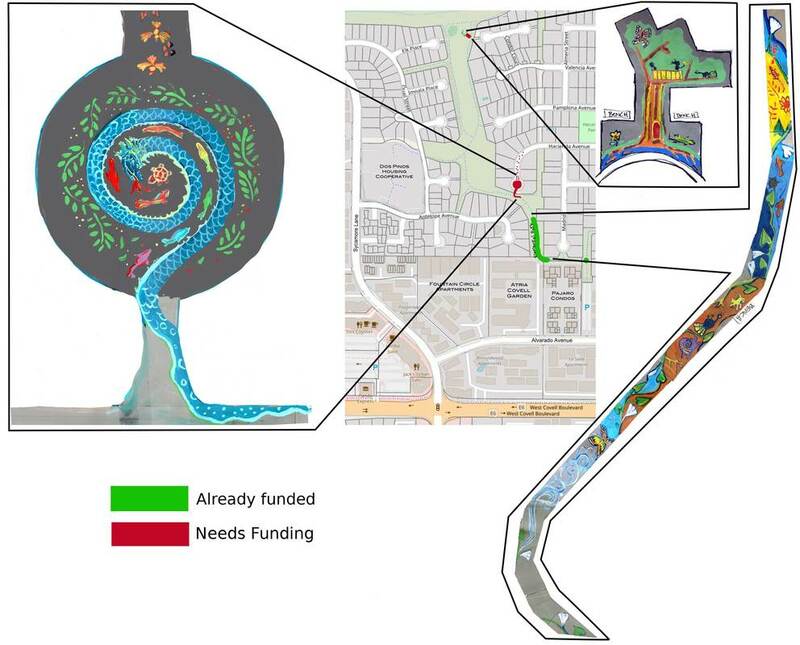 But our vision for a water dragon labyrinth and public plaza at Hacienda Avenue -- and extensions at Spider Park are not currently funded. That's where we're hoping you'll come in to support this project. your support is needed to make art happen! Please consider donating today to help make nourish the arts and build connections between generations and cultures in our neighborhood. We need to know our final paint budget by August 31, so don't wait to make your donation! The entire mural will be installed during a 3 day painting party on October 12-14. We hope you will join us for this free all-ages art party with music, food, and fun. It's a real kick to see the mural come to life -- from blank grey concrete and asphalt to color, life, and community. Save the Date -- Come and Paint!